Back in the 1980s and 1990s, Where in the World is Carmen Sandiego? was a pretty popular line of educational video games that eventually spawned a television show. The basic premise of the game is that Carmen Sandiego, or one of her henchmen, has stolen a famous landmark or artifact and you have to catch them. This mostly involved answering various trivia questions. While I probably played Where In The World Is Carmen Sandiego? a few times in school, I remember playing one of its counterparts Oregon Trail considerably more (which also recently got its own card game released by Pressman). I normally wouldn’t give much thought to a Carmen Sandiego card game as I didn’t have fond memories of the video game and these type of board/card games are rarely good. As the Oregon Trail Card Game was better than I expected though, I decided to give the Where In The World Is Carmen Sandiego? Card Game a chance. The Where In The World Is Carmen Sandiego? Card Game has a few interesting ideas but some broken mechanics lead to a dull and unsatisfying experience. Separate the cards into three decks: V.I.L.E. Henchmen, Loot, and Location. Shuffle each deck separately. Place one card of each type face down in the center of the table. Deal cards to the players depending on the number of players. Without looking at their cards, the players arrange their cards into a grid. One card of each type is placed in each row. The rest of the cards are placed face down to form three draw piles. Each player takes a evidence journal and a dry-erase pen. The youngest player will start the game. A player begins their turn by rolling the die. The symbol that the player rolls determines which type of card they can look at. 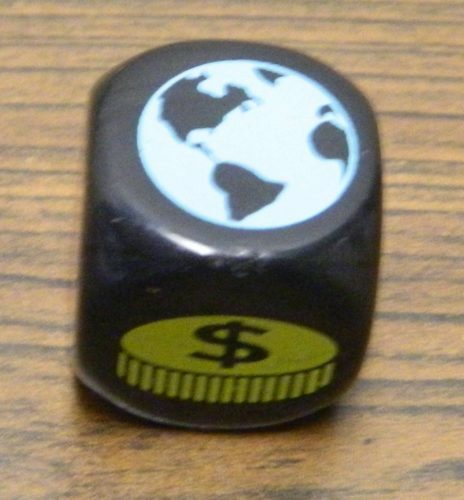 This player has rolled the location symbol on the die so they can look at one of the location cards. The player chooses which card they want to look at that matches the symbol they rolled. If a player hasn’t already seen their two/three cards of the symbol they rolled, they must look at one of their own cards that they haven’t seen. If a player has already seen all of their cards of the symbol they rolled, they can then choose one of the other players’ cards. A player flips over the card so only they can see it. This player has rolled a location symbol so they looked at one of the location cards. 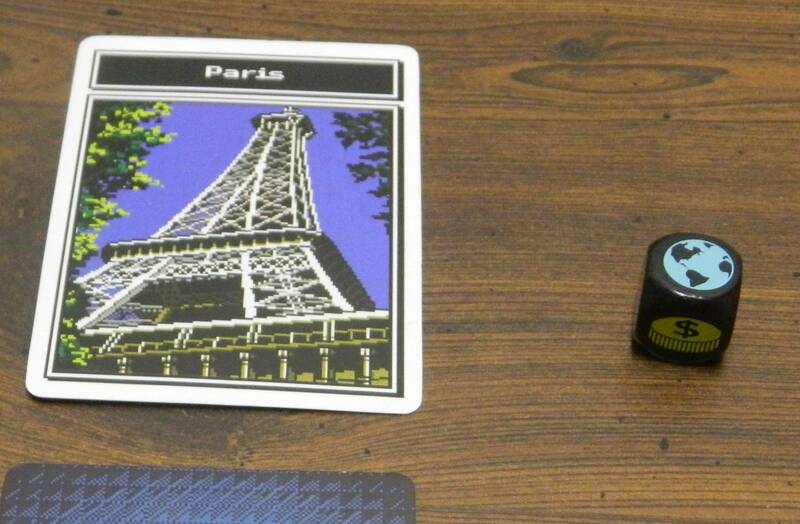 The location card was for Paris. Note that none of the other players would be able to see this card. After a player has looked at a card they should write down the location of the card in their evidence journal. They should indicate the specific position of the card and the player that controls the card. The card is then returned face down to the spot from which it was taken. This player looked at the Paris card so they marked who the card belonged to and that it was the top card. At the beginning or end of a player’s turn, the player has the opportunity to remove some cards from the game. Each loot and location card in the game has a corresponding card of the other type. These matching “pairs” are displayed next to one another in the evidence journal. When a player thinks they have found a match, they call out “I have a warrant”. They then flip over the loot and location cards that they think match. If the player was correct and the cards match, the matched cards are removed from the game. The player also gets to remove one henchman card of their choice from the game. The player has to be careful not to flip over Carmen Sandiego though. If a player flips over Carmen Sandiego at this point, its’ game over. The rules don’t clarify if the player who made the mistake is eliminated or if the game is over for all of the players. This player has found a match so they can get rid one of the henchmen cards. The player who made the match then has the opportunity to (they don’t have to) swap one of their cards for the corresponding type of card in the center of the table (the player can’t look at either card). If the player has no cards in front of them, they may switch any card in front of another player for a center card. The corresponding card taken from the middle is placed in front of the player who made the match. Players will then draw cards to replace the missing cards from their grid. This player got rid of one of their location and henchmen cards so they will draw new cards to replace the missing cards. If the player makes a mistake and the cards don’t match, the cards that were flipped over are then flipped back. The player to the left of the player who messed up gets to exchange one of their cards for one of the cards in the center of the table. The next player clockwise then takes their turn. 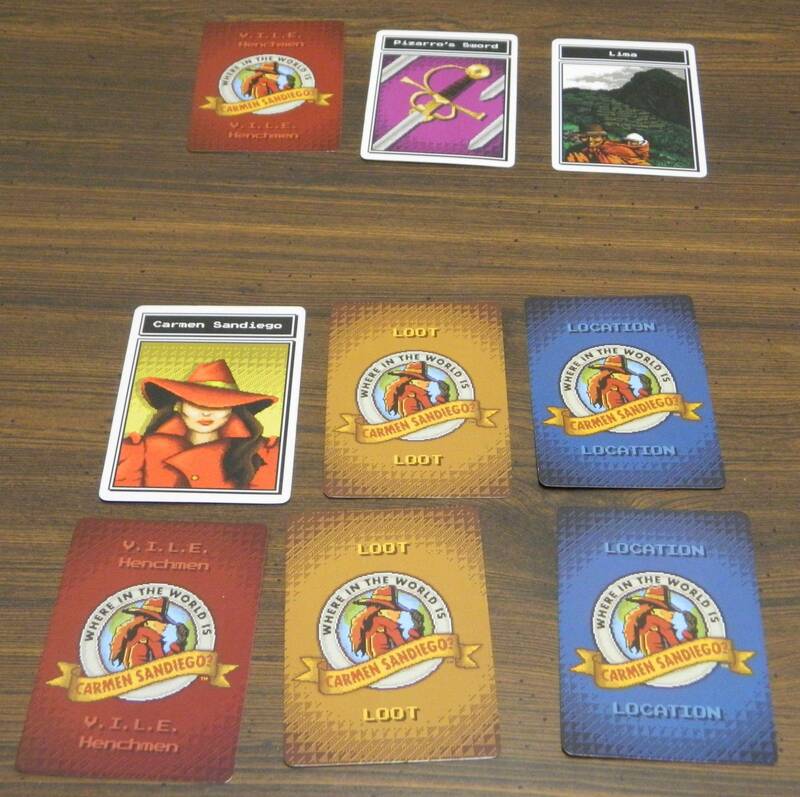 When one player thinks that there is a location/loot pair in the center of the table and they know the location of Carmen Sandiego, they can try to win the game. On their turn they call out “I have a warrant for Carmen’s arrest”. 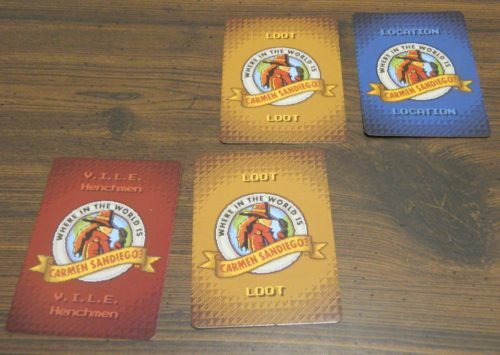 The player first says which location and loot card they think are in the center of the table. They then flip over the cards. 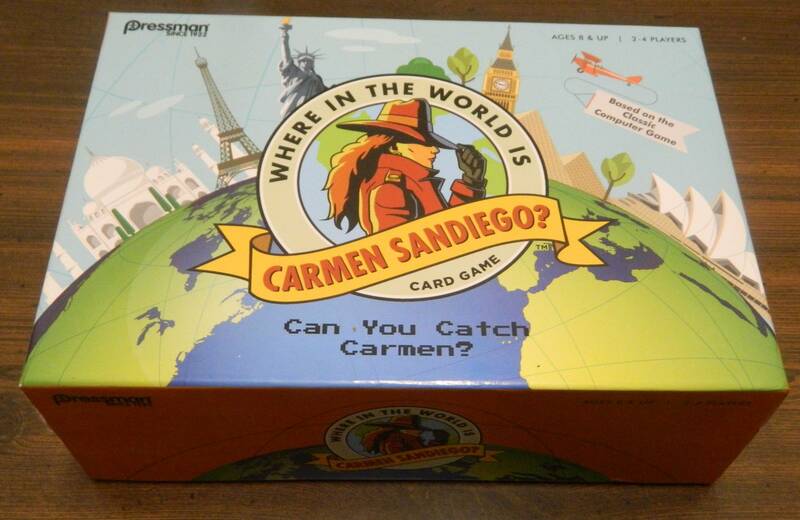 If they match, the player then has to point out where they think Carmen is located. This can be in the center or in front of any of the players. The card is then flipped over. If the card chosen is Carmen, the guessing player wins the game. 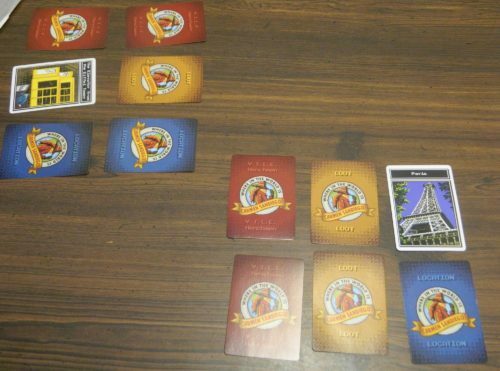 The current player uncovered the middle cards and they were a match. The player also revealed Carmen Sandiego so they have won the game. If the player was wrong about the center cards matching, the cards are flipped back over. Starting with the player to the left of the guesser, each player swaps one of their cards with one of the cards in the center. This continues until all of the revealed cards have been replaced. Play then passes to the next player clockwise. 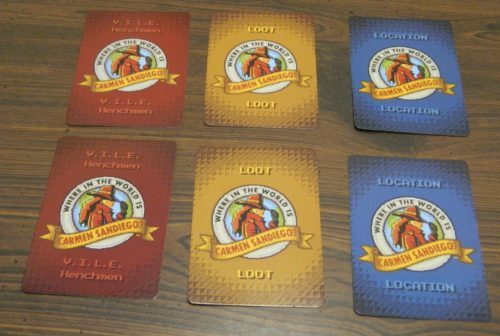 If the player failed to reveal the Carmen card, they are eliminated from the game. If all but one player is eliminated from the game, the last remaining player wins the game. As I mentioned at the beginning of this review, I really don’t have much memory of playing Where in the World is Carmen Sandiego?. While I remember playing The Oregon Trail in school, I don’t really remember playing any of the Carmen Sandiego games. I also don’t think I ever saw an episode of the TV show. With that said I will state that I have no nostalgia for the franchise. I wanted to point this out as people who remember the franchise favorably will probably have slightly different feelings towards the card game than I did. It is honestly hard to describe what type of game Where In The World Is Carmen Sandiego? Card Game is. 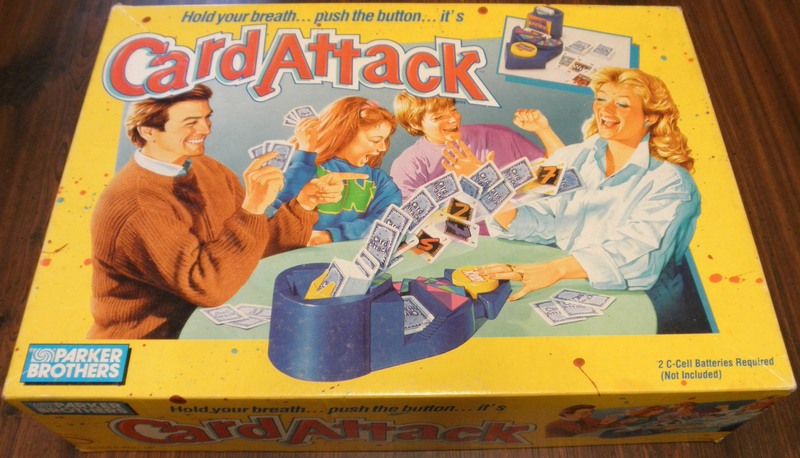 It kind of plays like your typical memory game as you are trying to find pairs of matching cards. It is not really much of a memory game though as you are encouraged to take notes on the location of various cards. As you are trying to find various cards, you would then think it must be a deduction game. While you take notes, there aren’t really any deduction mechanics in the game as you aren’t trying to solve a mystery or find the missing cards. You just roll a die and try to find matching cards. At the end of the day the Where In The World Is Carmen Sandiego? Card Game plays like an older children/adult memory game where you are allowed to take notes. At first I thought the Where In The World Is Carmen Sandiego? Card Game had some interesting ideas. 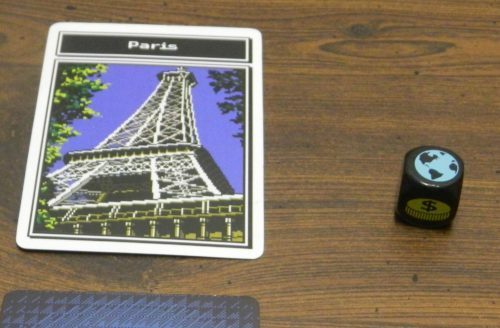 I have played a lot of different card/board games and I can’t remember playing a game quite like the Where In The World Is Carmen Sandiego? Card Game. I thought the mechanic where you looked at various cards and took notes was interesting. The note taking is far from complex but it is actually a key element to the game. If you don’t take good notes, you are going to have a hard time doing well in the game. Basically the key to taking good notes in the game is to write down the location of a card (top/middle/bottom) and which player controls the card. This prevents you from having to look at a card a second time while also helping you when cards move around. When the cards move around the table you need to keep good track of how the cards moved. If you know the identity of both cards, you need to make sure you swap the location information for both cards. If you don’t you are bound to make mistakes later in the game. Having to keep track of how the cards move around the board is an interesting mechanic. 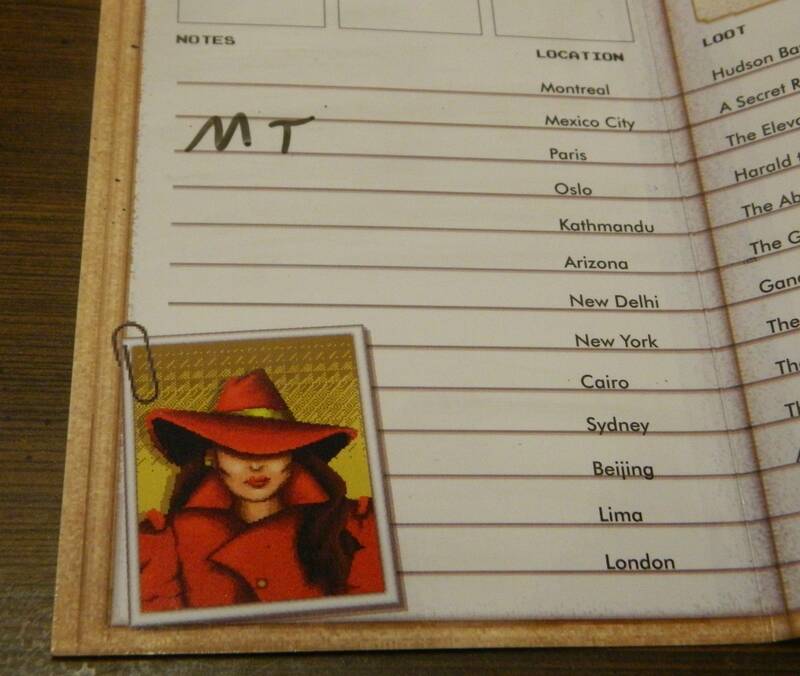 Along with the note taking mechanics, the Where In The World Is Carmen Sandiego? Card Game has a good base on which a memory/deduction game could have been built. The problem is that the rest of the game feels broken. The biggest problem with the Where In The World Is Carmen Sandiego? Card Game is that the end game makes little to no sense. Basically the goal of the game is to get a matching location and loot card in the center while also finding the location of Carmen Sandiego. Players look at various cards trying to find pairs and Carmen Sandiego. The game makes it seem like you want to find as many pairs as you can, but in execution it doesn’t really matter how many pairs you find. Outside of being able to change one of the cards in the center of the table, there is no reward for finding a pair. You just need to get a loot and location card in the center that match while also finding the location of Carmen Sandiego. The fact that finding matches doesn’t give you much benefit, kind of ruins the Where In The World Is Carmen Sandiego? Card Game. The game lets you exchange one of the cards in the center for one of your cards but that is not all that helpful. Unless the card you are moving matches the other card in the center or another one of your cards, moving a card to the center doesn’t do much. Generally another player(s) will know the identity of the card so you don’t even have the advantage of being the only player to know the card’s identity. As I will get to shortly, it becomes debatable whether you should even call out the matches. It is better to just keep the matches to yourself until you can win the game. The game really needed to give you some sort of benefit for finding a match, like getting another turn, to make it worth revealing the matches you have found. In addition to this end game scenario making little sense, it feels broken. While the goal is to make the two center cards match, you have little control over making that happen. Until you get rid of all of your cards, you can only move your own cards to the center. If none of your cards match each other or the other cards in the center, you can’t win the game until the cards in front of you or the center change. You could know the location of a card that matches one of the cards in the center, but if it isn’t one of your cards you can’t move it. Therefore the best strategy to win the game is to hope that you have two cards in front of you that match. Then while looking for Carmen Sandiego you need to find two other sets of cards that match. Once you have everything you need, you use the other two matches to put your two matching cards in the center. If you are unable to follow this strategy, you basically have to hope one of the other players mess up and give you the opportunity to win the game. This isn’t the only broken mechanic in the Where In The World Is Carmen Sandiego? Card Game. While it pays to take good notes on location and loot cards, the same can’t be said for the henchmen cards. The only information that really matters is whether a card is Carmen Sandiego. If a henchmen card you look at is not Carmen Sandiego, mark the location but you don’t have to write down the name as it doesn’t matter. When you find Carmen Sandiego write down her location. The henchmen category is then pointless for the rest of the game. You then just follow her around the gameboard as it no longer matters who is on the other cards. Basically once you have found Carmen Sandiego, it is totally pointless rolling the henchmen symbol again as it won’t give you any valuable information. Speaking of the die, the only purpose it serves is adding more luck to the game. If the game allowed you the choice of which card to look at, there would at least have been a little strategy as you tried to figure out which card you should look at. You could prioritize certain types of cards and your decisions might have had a small effect on the game. Instead you are stuck relying on the roll of a die. If you don’t roll the appropriate symbol, you can’t look at the type of card that you want. If you keep rolling the same symbol, eventually your turns become worthless (especially with the henchmen symbol). While the Where In The World Is Carmen Sandiego? Card Game would still have had problems, eliminating the die roll would have been the first step in the right direction. Unfortunately the Where In The World Is Carmen Sandiego? Card Game is not a very good game. As I mentioned earlier, I think there are some good mechanics in the game. There are a lot of problems with the game though. If you were to add some house rules to the game, I think it is possible to turn the Where In The World Is Carmen Sandiego? Card Game into a decent game. I don’t think it will ever be a great game but with enough tweaking I think you could create a solid game. I don’t know if it is really worth the effort though. Finally I wanted to quickly talk about the game’s components. First I would like to bring up the instructions. Rarely do I speak about a game’s instructions but I have to bring them up in this case because when you open up the instructions they actually play the game’s theme song. At first I thought this was clever as the theme song is kind of catchy. It gets annoying rather quickly though and you will quickly regret every time you have to open up the instructions. Otherwise I would say the component quality is pretty solid. The cards are thick enough and the pixel artwork is reminiscent of the older games in the series. I also like the inclusion of dry erase markers and boards as players don’t have to worry about running out of sheets or having to erase things as the cards are moved around. Should You Buy Where In The World Is Carmen Sandiego? Card Game? 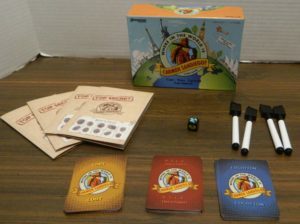 While I didn’t really play the video games in the Carmen Sandiego franchise when I was a kid, I was hoping like with the Oregon Trail Card Game that Pressman would do a good job adapting the video game into a good card game. Unlike The Oregon Trail Card Game though, the Where In The World Is Carmen Sandiego? Card Game is not a very good game. I thought the note taking and card moving mechanics had some promise as players had to take good notes to keep track of the cards. The problem is the rest of the game doesn’t really work. The end game doesn’t make a lot of sense and feels kind of broken. Instead of revealing matches when you find them, you need to try and keep them secret until you have everything else setup in order to win. Otherwise you have to rely on another player messing up in order to win the game. Add in the die rolling mechanic that only adds luck to the game, and it just isn’t that fun to play the Where In The World Is Carmen Sandiego? Card Game. If the game’s concept doesn’t really appeal to you or you never really cared for the video game, I don’t really see any point in picking up the Where In The World Is Carmen Sandiego? Card Game. With some house rules you could fix some of the problems and turn it into a decent game. It is probably not worth the effort unless you are a big fan of the franchise though. Unless you can find the game for really cheap, I wouldn’t recommend picking up the Where In The World Is Carmen Sandiego? Card Game. Has some interesting mechanics that had some potential. The game does a pretty good job utilizing the Carmen Sandiego theme. The goal of the game doesn't make a lot of sense and feels broken. The only purpose of the die is to add luck to the game.